This is a tiny plant growing in my backyard. I've showed it to you before, but these pictures are much better. Sadly, it's alien (as are almost all the vetches), but it's one of my favorites. Maybe because it's small and hides. Maybe because it tries hard to be bold and bright even though it's tiny. I'm not sure why I like it. 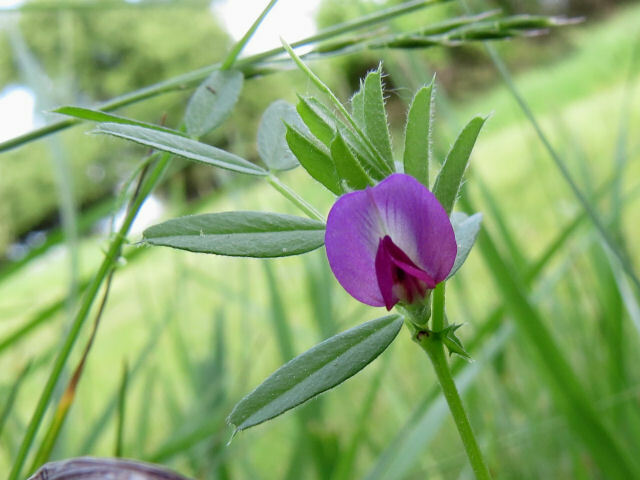 It's narrow-leaved vetch, Vicia angustifolia. By the way, just as "cernuum" means nodding, "angustifolia" means narrow-leaved. So if you see that in a plant name... well, it has narrow leaves. Here's how it hides down in the grass. 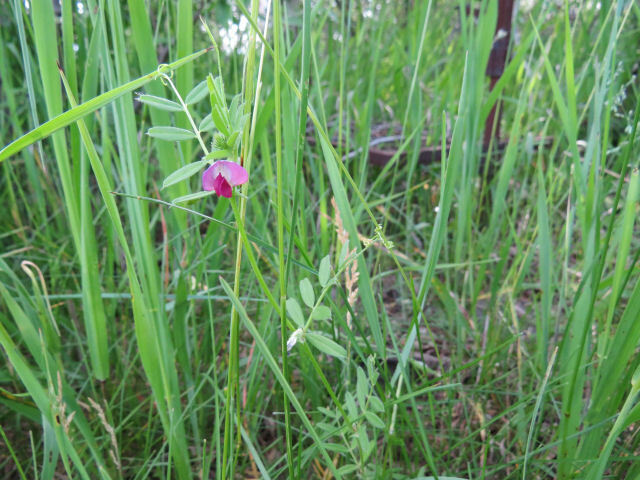 There are a couple of really distinctive things about this vetch. For one thing, it only has one or two blossoms on each stem. Most vetches have a whole lot of blossoms on a raceme (stalk). And those blossoms grow right out of the leaf axils (where the leaves meet the stem). This picture also gives you a pretty good look at the stipule, that little do-dad where the leaf meets the stem. Also look at the blunt tips on the leaves with a point sticking out. If you look at the flowers head on, they look very flat. You'd never guess they are long and tublular unless you saw the above view first. This flower is only about a half inch across. This is a widely distributed species of waste places and fields, but because it's small it's seldom noticed. For the botany purists, some still consider it a variant of V. sativa. 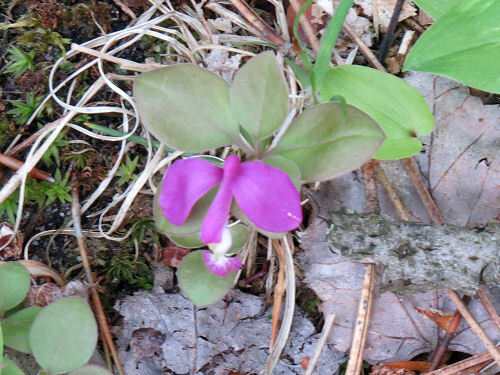 There are still more Ohio wildflowers to talk about, but I want to be sure to get to this one, so I'll do it now. This was the most exciting botanical find of the whole trip, and I didn't even see it in bloom. 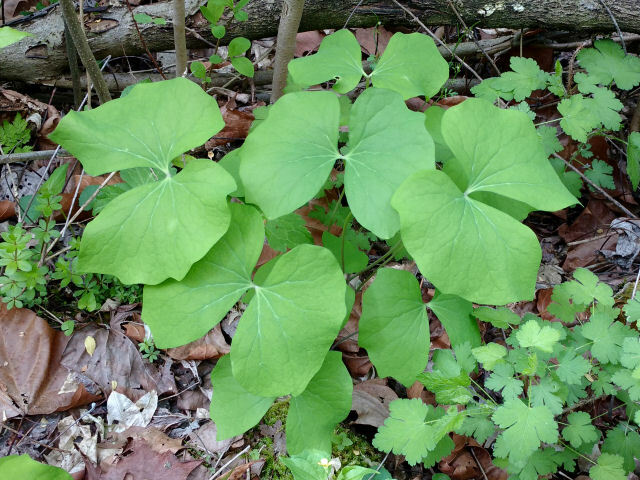 This is twinleaf, Jeffersonia diphylla You can easily see why it gets the common name, because of the split leaf. How rare is this? Pretty rare. Although this was in Ohio, I'll use the Michigan Floristic Quality Assessment document to make my point. This is a chart which lists all Michigan plants and gives various points of information about them. One of them is called the Coefficient of Conservatism. Although this is somewhat subjective, it purports to assign a number to each plant based on the number of habitats where it will grow. The numbers range from 0 to 10. So a plant with a CC of 0 will grow just about anywhere, it will be very common and you'd likely call it a weed. 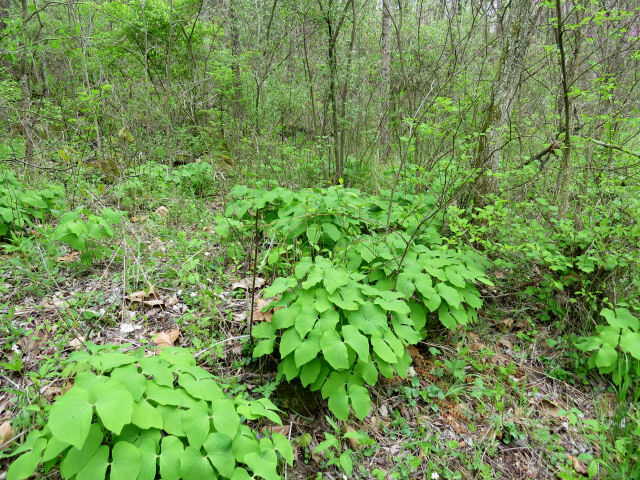 At the other end of the spectrum, a plant with a CC of 10 will require a very specialized habitat to grow, and you aren't going to see this plant very often. You'd probably have to go looking for the specific type of ecosystem. Jeffersonia has a CC of 9. See why I get pretty excited? It's protected in a number of states. If you get lucky, you can find it in most mid-Atlantic and midwestern states from Ontario to Georgia. I have to be honest and tell you that most of the miles of reclaimed mining land we walked through were covered with horrible invasive plants, particularly autumn olive, and black swallow-wort. When we happened across this area, about a half-mile along the trail, that was swathed in twinleaf, it was pretty amazing. Just so you know, the flower is white with eight petals. It looks a lot like the bloodroot flower, although they are not related. These had already bloomed this year. The seed pod is interesting, but I didn't manage to get a picture of it in focus. Here's another lovely wildflower. 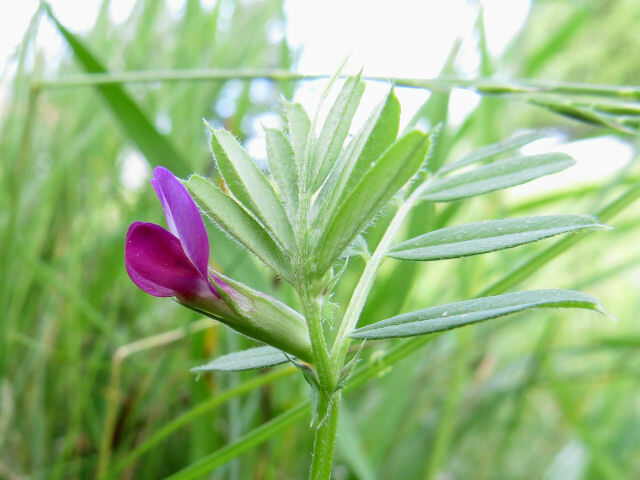 But at this time of year, there is a common alien plant that people often mistake for it. First, the real thing. 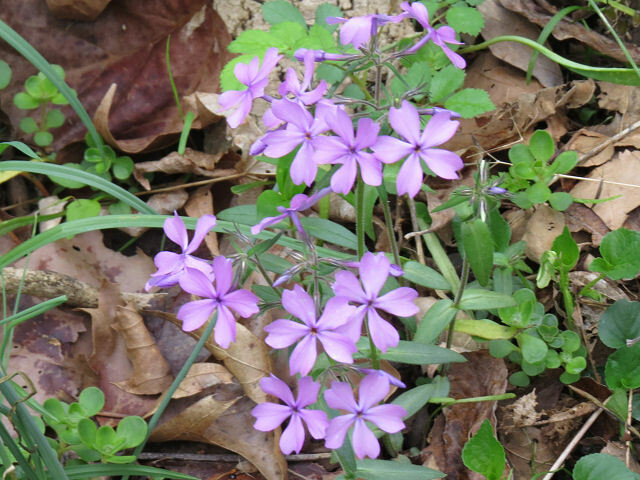 Woodland Blue Phlox, Phlox divaricata. This plant grows about a foot tall, sometimes a little more. It's usually found in messy-looking clumps. This species has notches in the tips of the petals. Garden phlox has similar flowers, but is taller. The thing to keep in mind is that all phlox have five petals. P-h-l-o-x has five letters, five petals. It also has opposite leaves. The lookalike that is beginning to cover the roadsides this time of year is Dame's Rocket, Hesperis matronalis. It does look a bit like garden phlox in growth habit and color. But, and here's where you can be the plant-smart person who KNOWS... D-a-m-e has four letters, and four petals. And, by the way, it has alternate leaves. I don't have a good picture of the Dame's Rocket, but when I get one I'll give you a comparison. 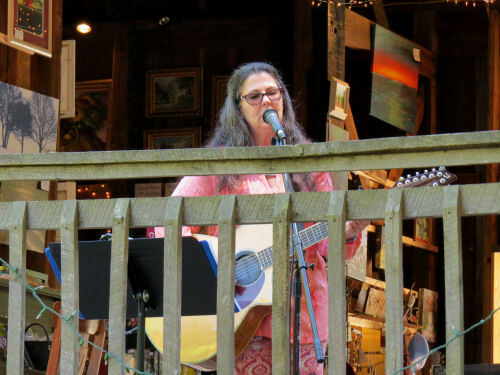 Yesterday I participated in one of the monthly vendor events at the Shagway Arts Barn. I won't be doing any others this year because it's just too hard to do Saturday events after Friday nights at work. 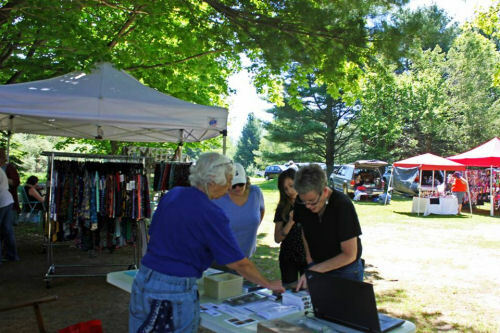 I have one other author event (at the Ludington Area Center for the Arts) planned for the summer, but that's IT. 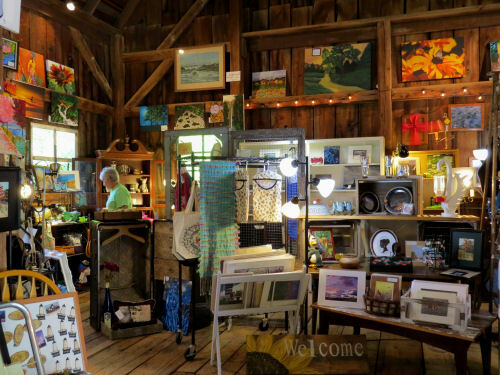 This first picture was taken by Nancy Miller, the owner and genius behind the barn. I like it! I'm telling a potential customer about my books. There was good traffic all day long and I interacted with quite a few people. Made one sale. 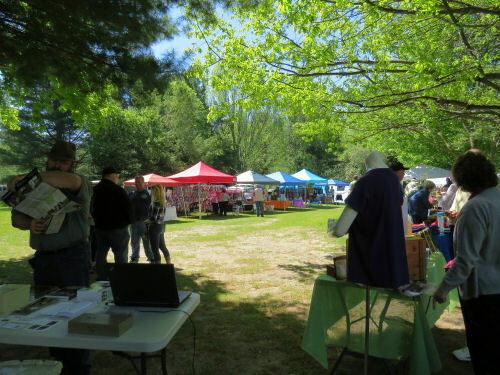 The weather was perfect, and here's what the vendor area looked like. 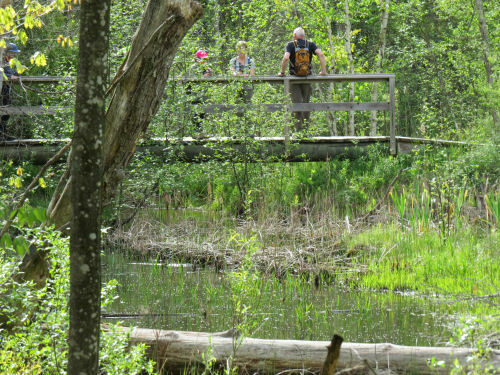 You can see a guy in the foreground looking at a North Country Trail map. One of the booths was set up for people to paint pictures. All the equipment was provided and instruction if they desired. They got to take the picture home, of course. 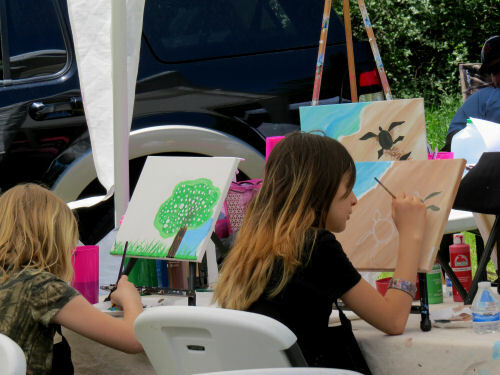 Here, two young artists take advantage of the opportunity. The inside of the barn, with the regular sales area, is looking really nice! Nancy said they actually did a pretty good business, too. She was pleased with their opening weekend of the season. All day long there was live music. In the morning, Alex Mendenall sang and played guitar. In the afternoon it was Cheryl Wolfram's turn. She's not really fenced in! Music is usually played from the balcony and people can sit outside under the trees to listen. Since I'd only had an hour of sleep, I fell asleep in my chair almost as soon as I got home. Woke up just enough to move to the bed and slept till 9 am! Today I've been chilling. Smell of rain through the open windows. Watching old Perry Mason shows. Knitting. Yes, the crochet bug has been overcome by the knitting worm. So I'm back to Michelle's socks for a while! Today was extra long at work, and of course I go back in an hour or so. 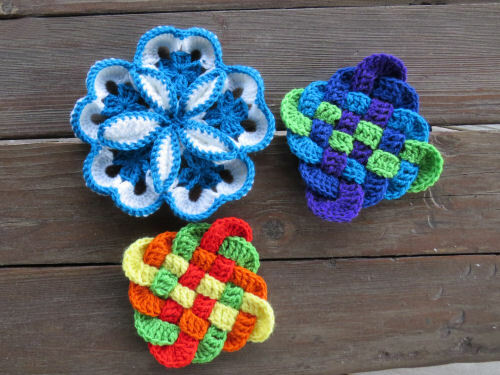 Just going to share a few more fun crocheted items. Now we wait to see if any of this stuff sells. I have a gift for picking things I think are cute that no one else wants. But I'm having a good time and deluding myself into thinking I'm being productive (half kidding... I really hope some things sell). Back to Ohio for another trillium. This one is sessile trillium, or toadshade, Trillium sessile. I suppose one might find a little toad hiding from the sun beneath the broad leaves. Or maybe the mottled leaves are supposed to look like a toad. But that doesn't help much when you discover many mottle species as I did in Alabama. Sure glad we had a local wildflower enthusiast with us to help with names on that trip. 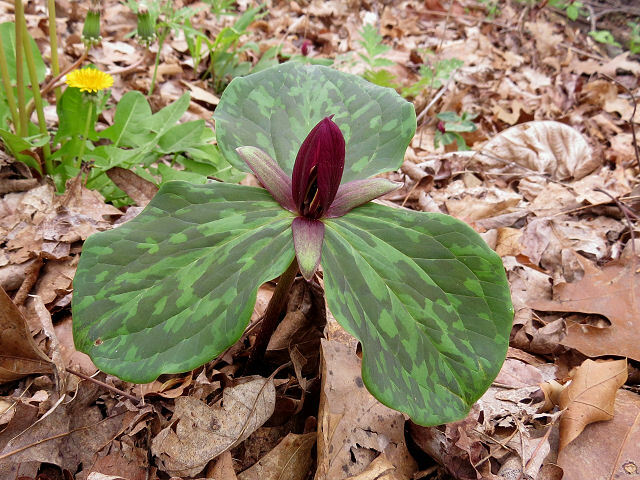 Until my trip to Alabama in the spring a couple of years ago, I did not appreciate how many similar trilliums there are with mottled leaves and dark red flowers. I think I would remember the differences next time I find some in the woods. 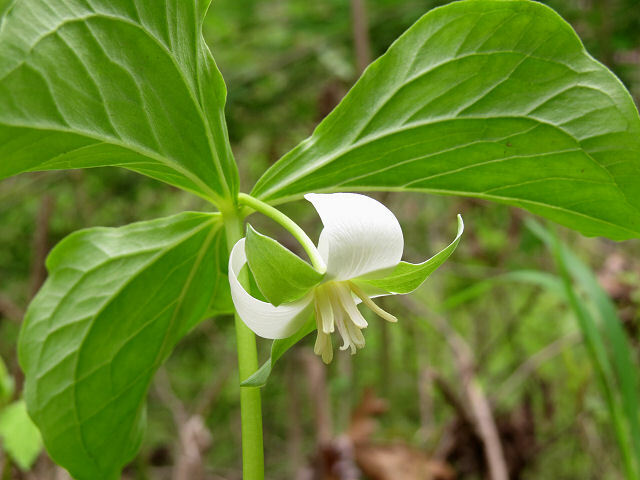 The similar ones I'm likely to find in the north are toadshade and prairie trillium. I've seen both, but don't have a picture of the prairie one. The big difference is that toadshade has broad leaves that don't narrow to the attachment point. That's easy to remember- they make better shade for that toad! 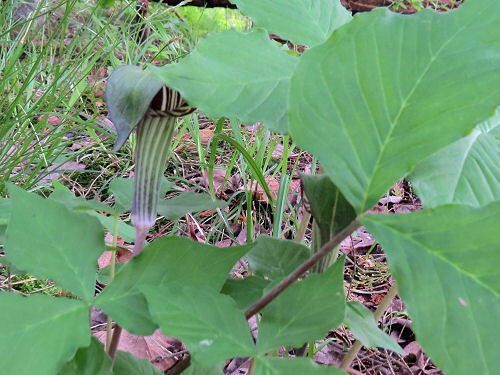 The sepals on toadshade often remain upright with the petals (just not on this particular one), but on prairie trillium they curve strongly downward- between the leaves even, so that they sort of hug the stem. That's distinctive. Now I want to go find more trilliums! But not tonight. I slept poorly last night (no reason I can think of), and work was long and hard. Headed to bed really soon because Friday is... well... longer and harder. Sometimes all I need is a little tiny bit of beauty to make me smile and everything is right. Work today was heavy-duty. Although everyone said it was chilly outside, I was sweaty and hot even with the small door open. Then the guys opened the big door to load the truck for the Oceana County run. When they pulled the truck away the door got left open for a while. It started to rain outside, really hard. 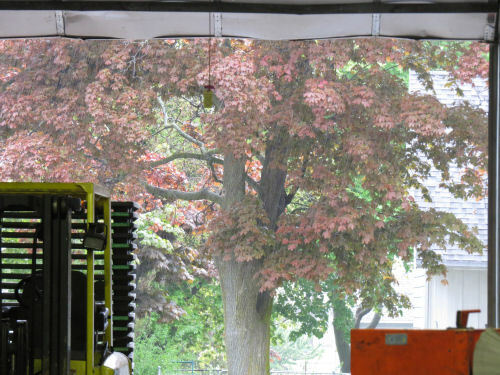 I just loved the view of this maple, leafing out, through the rain, through the door, beyond the pallets and "stuff." Lifted my spirits for the whole rest of the shift. I still have more Ohio wildflowers to share. Ohio in the spring never disappoints! Today we have nodding trillium, Trillium cernuum, which you could see in Michigan or pretty much anywhere in the NE US. But I don't see it very often! It's easy to recognize, because the white flower nods below the leaves, and the petals are recurved. I guess the stamens are usually purple, but I haven't paid enough attention in the past to know if they always are. Everything else about this plant screams T. cernuum, so I'm sticking with that diagnosis. Let's talk Latin. Cernuum (sir-NEW-um) means having the face inclined toward the earth, eg. bowing or nodding. So whenever you see a plant name with that word (or cernuus or cernua), it's probably going to have a nodding or downward aspect. I tried to find a modern word that comes from that root as a memory aid, but didn't have any luck. We'll just have to remember it, cold. 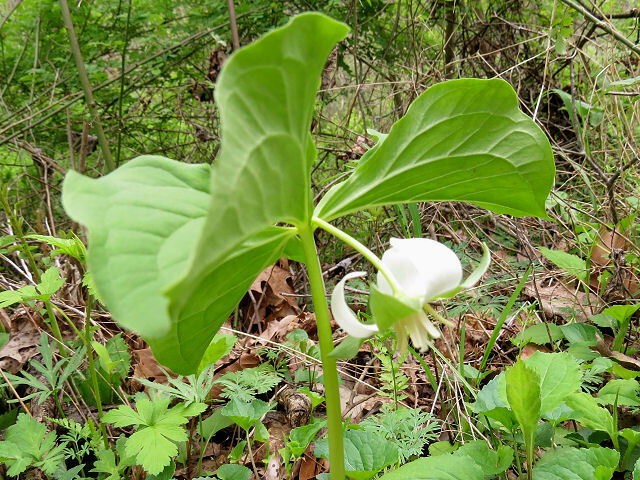 There are about 50 species of trillium, and I now have eight in my plant photo pages. And there is one more yet coming to you from Ohio! 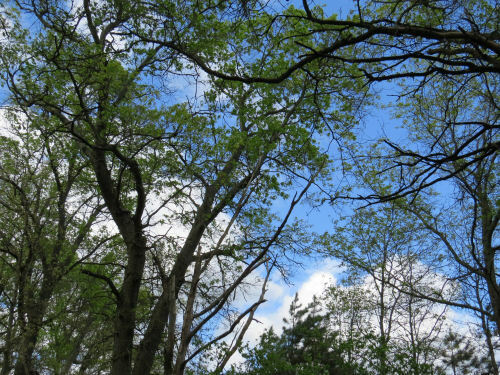 Actually, I never posted about hike #1, because I was still doing accounts of the Ohio hike. Anyway, this is the second in a series of 13 hikes through the summer and fall. 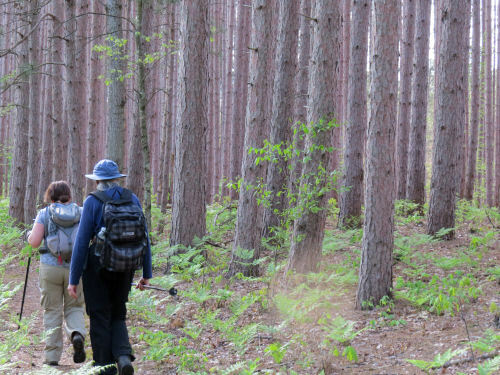 Those who participate in every one will have hiked all 120 miles of the North Country Trail in the Manistee National Forest when we finish. Today there were 10 of us. Here's the requisite group photo. It's really just an easy way to document who came. The morning was rainy, but according the radar the storms had passed over, and sure enough we got sun and blue sky! Perfect hiking temperatures too, in the low 60s. A few people had signed up but then didn't show. They sure missed a great day. 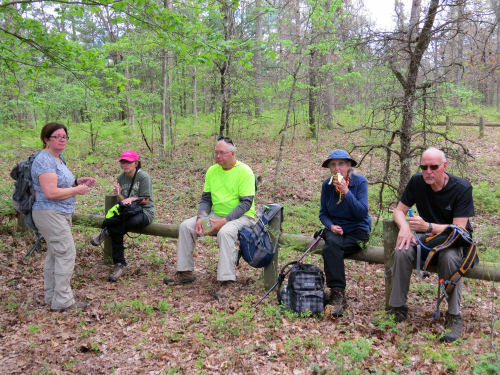 I doubt that the Forest Service planned for this barrier to be a bench, but it made a great place for a rest stop. We covered 11 miles of trail and only about a half mile was roadwalk. 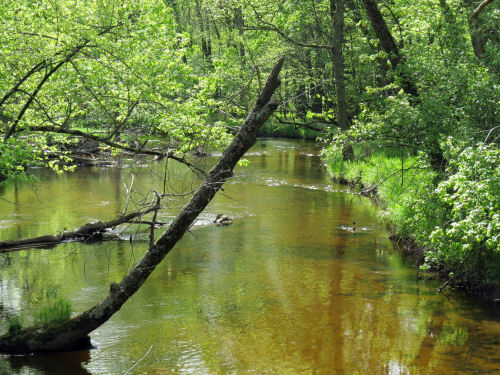 Here's the crossing of the White River. The last time I hiked this piece it really was raining. Everything was gray and the people were covered with ponchos. So it was nice to see it in sun. Near the end of our hike we crossed the much smaller Rattlesnake Creek. Red pine plantations aren't considered very good management practice any more, but they always make for good pictures. One of the best parts of today's hike for me is that many of the spring wildflowers are now opening. Here are my best pictures of the day. Gaywings (not an orchid, but they sure look like one). 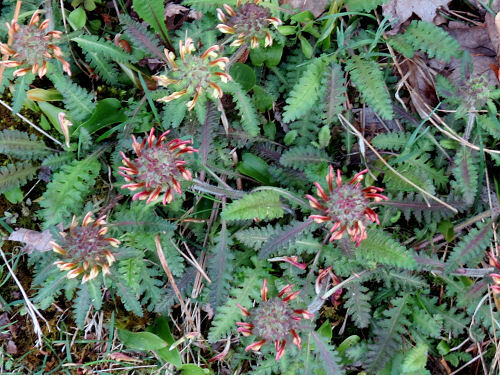 Wood Betony or Lousewort. Flowers may be yellow, maroon or a mixture like these. I thought this top-down view made them look like firecracker pinwheels. 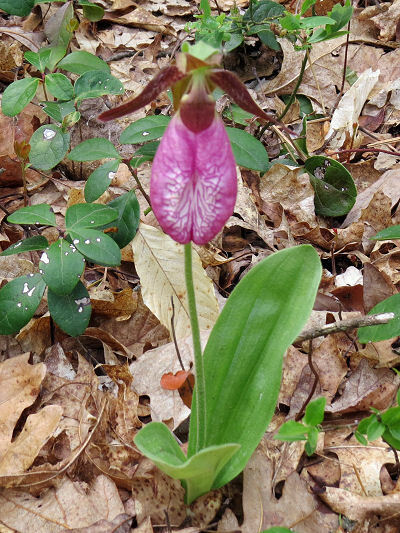 And all along the way the pink lady slipper orchid was blooming. Always a favorite. Even though we got a late start our pace was good and we finished the 11 miles in about 3.5 hours with three rest stops. Everyone had a great time. 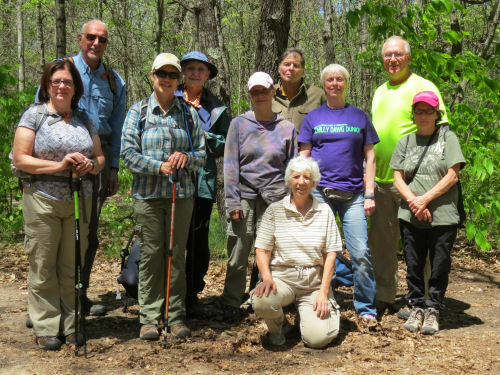 Nine of the ten people also came to the first hike, so potentially those nine people could do all the Manistee this year. Of course anyone could "make up" a missed hike on their own. 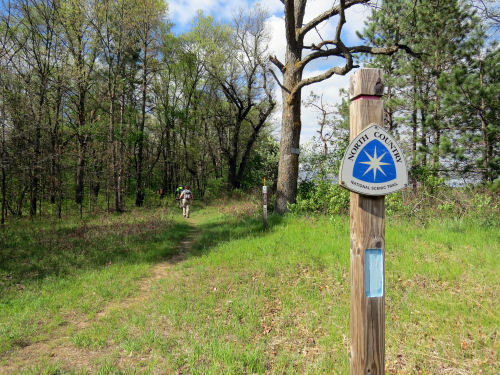 North Country Trail, Newaygo County. 40th Street to M-20. Yesterday I was impossibly tired. Worked all day and all night anyway. So Saturday is my chill day. I get to give myself a break and not feel guilty if I don't accomplish anything. That said, I started to feel "project-y" around 4:30. No, I didn't do all these today. Ann asked to see what crafts I have been making to put at Shagway Arts Barn this summer. The answer is lots of various stuff. Some I had previously made, some is new. 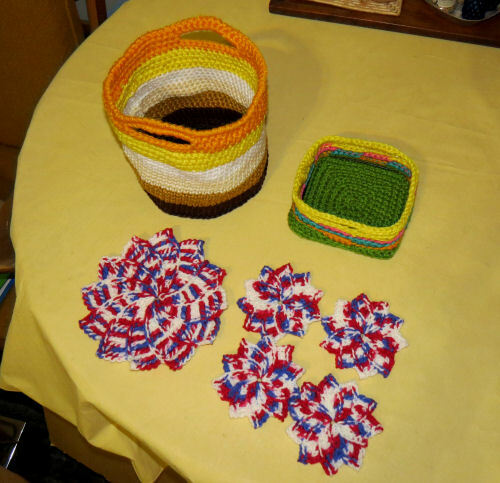 Over the past week, I made the patriotic mat and coaster set and the round ombre brown/yellows basket. Today I tried the square basket. We will have to call this a prototype. The results aren't good enough to suit me yet. 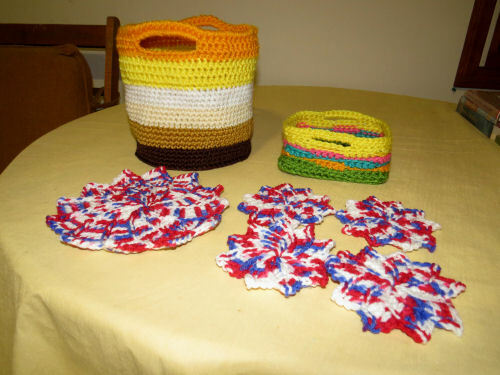 I did manage to solve some of the issues I don't like about crocheted baskets, but the implementation in this particular one isn't stellar. Nevertheless, I like it as a starting point. Tomorrow is bell choir, and in the afternoon I'm leading a hike. My energy better be back in the morning! And there should be trail pictures tomorrow. Although I uncharacteristically started the day on 8.5 cylinders, work was long and stressful, and I have to be back there at 9 am. Going to do an easy post. And funny too, I think. You can laugh or not. 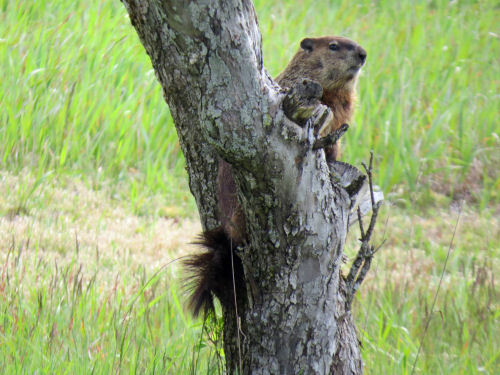 Instead of heading for cover, the woodchuck in my side lawn climbed a tree when he saw me! He looks fairly annoyed, too.